Whitfield County's Macey Morgan was keynote speaker. Approximately 2,000 people bundled up for freezing temperatures as they headed to Whitfield County, Georgia to honor more than 200 Georgia Northwestern Technical College graduates who walked the stage at the college's Fall 2018 Commencement Ceremony at the Dalton Convention Center Tuesday, Dec. 11. GNTC's 2018 GOAL (Georgia's Occupational Award of Leadership) Award winner, Macey Morgan, gave the graduating class their commencement speech. The Whitfield County, Georgia resident represented the college in the GOAL competition this past spring in Atlanta. Many programs made headlines this graduation with perfect performances by their entire graduating class. Among those were Diagnostic Medical Sonography and Radiologic Technology. Of the 14 of those graduating from Radiologic Technology, 13 of those have completed their registries. The final student was slated to take the exam Saturday, Dec. 15. As for Radiologic Technology, all 26 graduating students successfully passed their credentialing exams. All graduates participating in the ceremony were recognized for their academic achievements and presented with their associate degrees, diplomas, and certificates. Listed are graduates who took part in the commencement exercise for the Fall 2018 graduation ceremony. This list does not include eligible students who did not participate in graduation. Band Director Brandon Self, far right, accompanies his band in the parade. The student leadership of the Rambler Band has put in ample work to ensure a productive marching season. 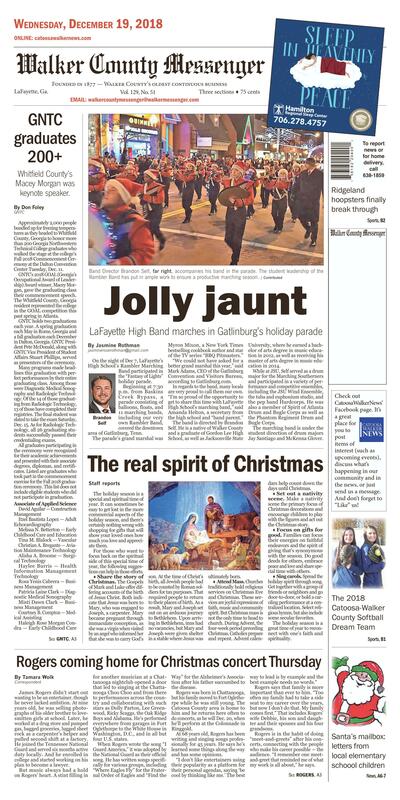 On the night of Dec 7, LaFayette's High School's Rambler Marching Band participated in the "Fantasy of Lights" holiday parade. Beginning at 7:30 p.m. from Baskins Creek Bypass, a parade consisting of balloons, floats, and 11 marching bands, including our very own Rambler Band, covered the downtown area of Gatlinburg, Tenn. The parade's grand marshal was Myron Mixon, a New York Times bestselling cookbook author and star of the TV series "BBQ Pitmasters." "We could not have asked for a better grand marshal this year," said Mark Adams, CEO of the Gatlinburg Convention and Visitors Bureau, according to Gatlinburg.com. In regards to the band, many locals are very proud to call them our own. "I'm so proud of the opportunity to get to share this time with LaFayette High School's marching band," said Amanda Helton, a secretary from the high school and "band parent." The band is directed by Brandon Self. He is a native of Walker County and a graduate of Gordon Lee High School, as well as Jacksonville State University, where he earned a bachelor of arts degree in music education in 2012, as well as receiving his master of arts degree in music education in 2014. While at JSU, Self served as a drum major for the Marching Southerners and participated in a variety of performance and competitive ensembles, including the JSU Wind Ensemble, the tuba and euphonium studio, and the pep band Hardcorps. He was also a member of Spirit of Atlanta Drum and Bugle Corps as well as the Phantom Regiment Drum and Bugle Corps. The marching band is under the student direction of drum majors Jay Santiago and McKenna Glover. The holiday season is a special and spiritual time of year. It can sometimes be easy to get lost in the more commercial aspects of the holiday season, and there's certainly nothing wrong with shopping for gifts that will show your loved ones how much you love and appreciate them. • Share the story of Christmas. The Gospels of Mark and Luke offer differing accounts of the birth of Jesus Christ. Both indicate that Jesus was born to Mary, who was engaged to Joseph, a carpenter. Mary became pregnant through immaculate conception, as she was a virgin when visited by an angel who informed her that she was to carry God's son. At the time of Christ's birth, all Jewish people had to be counted by Roman soldiers for tax purposes. That required people to return to their places of birth. As a result, Mary and Joseph set out on an arduous journey to Bethlehem. Upon arriving in Bethlehem, inns had no vacancies, but Mary and Joseph were given shelter in a stable where Jesus was ultimately born. • Attend Mass. Churches traditionally hold religious services on Christmas Eve and Christmas. These services are joyful expressions of faith, music and community spirit. But Christmas mass is not the only time to head to church. During Advent, the four-week period preceding Christmas, Catholics prepare and repent. Advent calendars help count down the days until Christmas. • Set out a nativity scene. Make a nativity scene the primary focus of Christmas decorations and encourage children to play with the figures and act out the Christmas story. • Focus on gifts for good. Families can focus their energies on faithful endeavors and the spirit of giving that's synonymous with the season. Do good deeds for others, embrace peace and love and share special time with others. • Sing carols. Spread the holiday spirit through song. Get together with a group of friends or neighbors and go door-to-door, or hold a caroling performance at a centralized location. Select religious hymns, but also include some secular favorites. The holiday season is a great time of year to reconnect with one's faith and spirituality. James Rogers didn't start out wanting to be an entertainer, though he never lacked ambition. At nine years old, he was selling photographs of his older brother to lovesmitten girls at school. Later, he worked at a drug store and pumped gas, bagged groceries, lugged sheet rock as a carpenter's helper and pulled second shift at a factory. He joined the Tennessee National Guard and served six months active duty locally. And he enrolled in college and started working on his plan to become a lawyer. But music always had a hold on Rogers' heart. A stint filling in for another musician at a Chattanooga nightclub opened a door that led to singing at the Chattanooga Choo Choo and from there to performances across the country and collaborating with such stars as Dolly Parton, Lee Greenwood, Ricky Scaggs, the Oak Ridge Boys and Alabama. He's performed everywhere from garages in Fort Oglethorpe to the White House in Washington, D.C., and in all but four U.S. states. When Rogers wrote the song "I Guard America," it was adopted by the National Guard as their official song. He has written songs specifically for various groups, including "Where Eagles Fly" for the Fraternal Order of Eagles and "Find the Way" for the Alzheimer's Association after his father succumbed to the disease. Rogers was born in Chattanooga, but his family moved to Fort Oglethorpe while he was still young. The Catoosa County area is home to him and he returns here often to do concerts, as he will Dec. 20, when he'll perform at the Colonnade in Ringgold. At 68 years old, Rogers has been writing and singing songs professionally for 45 years. He says he's learned some things along the way and has some opinions. "I don't like entertainers using their popularity as a platform for their personal agendas, saying 'be cool by thinking like me.' The best way to lead is by example and the best example needs no words." Rogers says that family is more important than ever to him. "Too often my family had to take a side seat to my career over the years, but now I don't do that. My family comes first." That includes Rogers' wife Debbie, his son and daughter and their spouses and his four grandsons. Rogers is in the habit of doing "meet-and-greets" after his concerts, connecting with the people who make his career possible — the audience. "I remember one meet-and-greet that reminded me of what my work is all about," he says. "It was a normal day at Dollywood, except for the rain. It was pouring and people were literally jumping puddles. Attendance was down. My theater seated at least 1,000, but there were only about 100 people there for the show. I went on stage not feeling that great. The applause was moderate, and I was having trouble reading the audience. I did my best for an hour then went back stage for a short breather before the meet-and-greet." When he stepped back out to shake hands and chat, Rogers found just one person waiting for him. "I wanted to tell you," said the lady, "that while you were singing, I looked over at my husband and son and they were smiling. It's the first time I've seen them smile since our daughter died, and it made me realize there's hope." The woman's 8-year-old daughter had been killed in an accident. Her church thought it might help the family to get away for a short time and paid for them to visit Dollywood. "You never know how a song or something you say will touch a heart," says Rogers. "I went back to my dressing room and looked up toward God and said, 'Oh, so it's not always about me,' and I was thankful I could be there for that family."